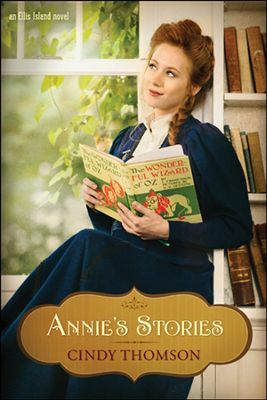 Annie’s Stories was a delightful tale full of mysteries, hope, friendship, and books! I had not realized until further into the story that it was the second book in the Ellis Island series. Yet because this book was such an easy read, I do plan on reading the first. The story centers around an Irish immigrant named Annie Gallagher in 1901. Like many immigrants, Annie has a story. Her mother passed away at her birth and her father was a travelling storyteller. He soon dies and Annie is left with her uncle. A misunderstanding leaves her in an awful place until she is rescued by a reverend. She is sent to live with his sister, Mrs. Hawkins, in the United States. There she becomes Mrs. Hawkins’ housemaid. She didn’t inherit much from her father, but when she finds herself sad, she reads some of the stories he left for her. They are precious to her and her only inheritance. Stephen Adams is the local postman with his own story. He lives in the building of Davis Publishing and is an avid reader. It’s not long before Annie Gallagher catches his eye. He tries to find ways to connect to her, and one works: books. A very popular story has arisen by the name of The Wonderful Wizard of Oz. Everyone is talking about it, even the publisher Stephen lives above. Mr. Davis desperately wants to publish a story similar to Oz, and he gives Stephen the job of finding an author. It’s not long before Stephen learns of Annie’s stories, and discovers a HUGE secret. But will she want to share them? This is not the only trouble surrounding Annie. Authorities are soon inquiring and making accusations about a new boarder in Hawkins house. I found this story intriguing and pretty genuine. Annie struggles with something that I’m sure many do. She questions where God was and if He really cares about her. Stephen also has his own God moments. He seeks guidance and soon finds that he’s been holding on to things he needs to let go off. Even though Annie’s Stories was fiction, I felt that the message was very true. I loved the way Ms. Cindy Thomson wrote the book. The characters felt real and complex. Each one, as the reader comes to find, has his/her own secrets, and each plays into the plot. This was a wonderful story and I recommend it to anyone who enjoys historical fiction, a lighthearted tale, or just wants a good book to read! I received this book from the Book Club Network and Tyndale Publishing in exchange for my honest opinion.